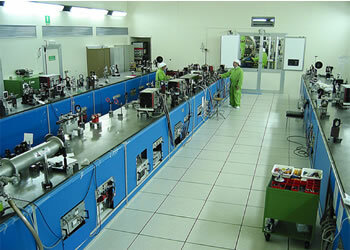 Inertial confinement is another line of fusion research that has been developed according to the Lawson criterion (see ABC facility). Here, a series of micro-explosions is obtained through bombarding a small sphere containing a deuterium-tritium mixture by high-energy laser or ion beams. The electromagnetic energy of high-powered laser beams (or the kinetic energy of the accelerated particles) is uniformly transferred onto the sphere’s surface, which evaporates and, according to the action-reaction principle, the fuel is compressed and heated. This gives a very high density plasma, but it is confined only for a very short time.